The first electric vehicle charger in Santiago, Chile, and Latin America as a whole, was installed by Enel Group in April 2011, marking the first step for electric mobility in the country. At the time, electric vehicles and charging infrastructure was almost non-existent in South America. 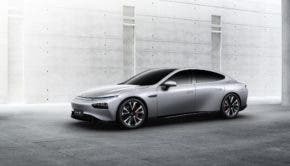 For the Chilean public, it was a new idea, but for the Enel Group, which had a vision that electro mobility could accelerate rapidly in the upcoming years, it was the perfect time to start the electric vehicle revolution in Chile. Fast forward to today and the government of Chile has now endorsed a public-private alliance that includes a collaborative partnership between Enel X, Metbus, and BYD. As part of the partnership, the first 100 electric buses were incorporated into the public transit system of Santiago on December 15th, 2018. The new purchase is not a pilot project, but represents a significant step forward for the electric vehicle revolution in Chile. Beyond the investment in e-buses, in this configuration Enel X has developed a “turnkey” package that includes the engineering and construction of the project, as well as the provision of charging stations and energy to power all the electric buses of the Chilean capital’s public transport system. Like many countries, Chile has a goal of 100% renewables by 2040 in its National Strategy for Electric Mobility. The 100 bus purchase from BYD is just the start of a full conversion of the transit system in the country to electric transportation. As part of a longer-term vision, Enel brought the first electric bus to Chile in 2014. This was part of the inauguration of Smartcity Santiago, the first smart city prototype implemented in Chile. The Smartcity project serves as a laboratory where a number of new technologies will be tested to improve the lives of city residents. One of the technologies Smartcity Santiago is working to implement is electric transportation. The first BYD bus in the Smartcity Santiago pilot operated between the Escuela Militar Metro Station, in Las Condes district, and the University of Mayor campus in Huechuraba district. Specialists monitored the new electric bus route closely, tracking the energy consumption, efficiency, and costs associated with the new bus along with the utilization of the bus, number of passengers transported, and average speed. This first electric bus experience was fundamental to a deeper understanding of the new technology and led to a more demanding follow up test. This second electric bus pilot route was implemented in downtown Santiago, and was hosted as a joint project between the Municipality of Santiago and Enel, which offered the service for free to residents and tourists alike in Santiago. The route was important, as it connected important areas of Chile’s capital, like the President’s Palace, Estación Mapocho (an old train Station), the Central Market, and the Museo Bellas Artes, which, with their high volumes, put the new bus to the test. In addition to simply providing bus service for the new route, the new electric buses were also comfortable, offering wifi and charging stations for mobile phones. 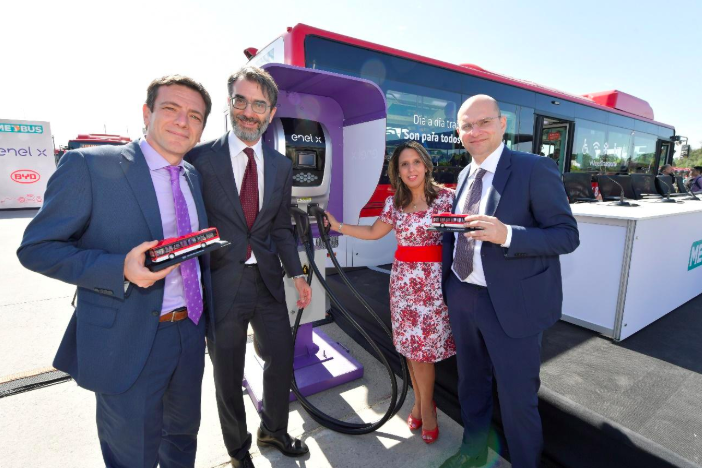 As a result of the good response, the specs of the new bus were used as the new standard for electric buses by the Chile Transportation Authority, guaranteeing that it was compatible and able to be used in the public transit system of Santiago (Transantiago). After the success of the pilot projects, bidding was opened to upgrade the bus fleet of Santiago as Chilean officials looked to take the next step towards the National Electric Mobility strategy that called for a full electrification of the bus fleet by 2040. Is a fully electric public transit system possible in Chile? As of a few years ago, the answer would have been no, or it would have only seemed possible in the future. With the exception of China, no country in the world has large fleets of electric buses being actively used in their cities. But today, the projections in Santiago are promising: in December 2018, the capital of Chile became internationally known with the addition of 100 electric buses in its urban transit network. A story which began as an idea three years ago is now a reality thanks to the successful public-private alliance. From a feasibility and technical point of view, the evaluation has been very positive. Each fully loaded bus performs well on the steep roads, with an average of 238 km of driving per day. In total, the new buses have transported 345,000 passengers, achieving a reduction in unpaid tickets of 6.5% compared to a similarly sized diesel bus, as people see the value in the electric busses and are willing to support the system. From an energy perspective, the pilot revealed that the new buses were three times more efficient than conventional diesel buses. This efficiency translates to a lower cost to operate: for each kilometer driven, an electric bus requires 0.1€, which is significantly lower than the 0.4€ on average needed with petroleum. At the end of the one year pilot, the two buses had driven 105,981 kilometers with an average uptime of 99.2%, eliminating any doubt about the reliability of the technology for officials. The members of the private-public partnership in Chile — including BYD Chile, Metbus, the minister of Transportation of the Chilean Government, and Enel X — traveled to Nanjing, China, to see the origins of this monumental leap forward in electric mobility in the history of the country. The workers in the BYD factory in Nanjing have built more than 14,000 buses for the city of Shenzhen in China and also built the 100 red and white electric buses for Santiago. The buses for Santiago took 60 days and 936 workers to build in Nanjing before they were put on a boat and sent to their new home. To implement a sustainable electric transit system, more is needed than just a fleet of buses. The development and implementation of new infrastructure is vital to ensure that the new buses are able to operate safely and efficiently in the city. 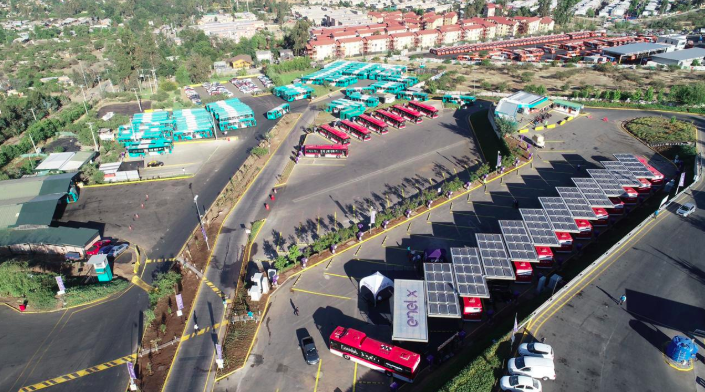 To meet this need, Enel X has constructed the first electric bus terminal, in the Peñalolén district. The terminal has 63 charging points with a connected power capacity of almost 3 MW for the buses. It also offers solar-shaded parking that creates energy for the bus charging. 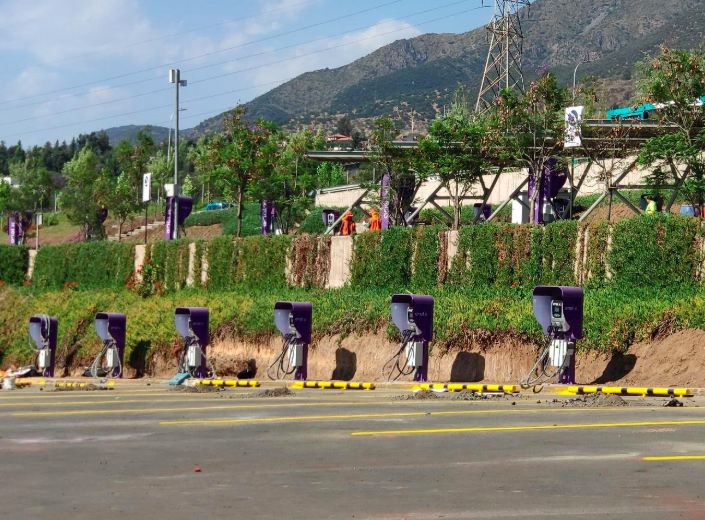 Another 37 charging points with a connected power capacity of almost 1.5 MW is available at the other end of the bus route at the Maipu bus depot. To ensure optimal charging of the buses, a real-time smart charging solution was implemented, which allows fleet managers to manage and control the energy storage of the fleet with an eye on the maximum power pulled from the grid by the buses. All of these advances in Santiago’s public transit system opened the door to the creation of the first “Electric Bus Corridor” in Latin America. What is the Driver’s Experience? Jaime Riveros is 47 years old, and has spent 20 of them in the public transit sector. He is familiar with even the oldest of the buses, and has worked through various transitions in the transit sector, including the transition to the current service provider Transatiago, in 2007. He’s aware that he’s at forefront of this movement now that he’s driving the most modern buses in the city system. Currently, he’s behind the wheel of one of the new BYD electric buses that came to Santiago as part of the BYD, Enel X, and Metbus partnership. Riveros explains that buses are part of his DNA. “I always had had something to do with buses, working on them and fixing them,” he explains. But he just began driving the buses three years ago to pay for the education of his three children. Today, he drives the electric bus on Metbus route 516 (Maipú-Peñalolén), which leaves the station at Santa Ana every morning at 6:00 am. Jaime always arrives half an hour beforehand to take his time with breakfast. He’s a man who smiles a lot when talking and that smile is part of his daily tasks. “I like to greet the passengers with joy. We are also part of their day,” Riveros explains. He says he’s happy and it’s not hard to pass on his joy. “These buses are improving the well-being of the drivers and the passengers. Entering one already changes your face. It has air conditioning and they don’t make noise. They’re very quiet and I don’t have headaches anymore,” Jaime explains. Because of its location and geography, Santiago has dense air pollution. For this reason and many others, electric transportation must be a part of the solution to help reduce the air pollution in the city. The Chilean President, accompanied by Enel X, Metbus, and BYD, had the honor on December 13th of leading the ceremony that officially presented the first 100 electric buses to the city. When President Piñera announced at the ceremony that 100 new fully electric buses would be put into service in Santiago, it was clear that this was a huge milestone, as Chile is now home to the second largest fleet of electric buses, only behind China. Similar initiatives are being launched in other countries in Latin America. Within the framework of the Global Sustainable Electricity Partnership (GSEP), Hydro-Québec, and Enel are spearheading a project in agreement with the Peruvian Ministries of Energy and Mines, Environment, and Transport and Communications, and Protransporte (local public transit operator) to add the first electric bus into Lima’s official public transit system. This is a major step towards creating greener public transport in Lima and in Peru. Enel X is eager to replicate the success it has made possible in Santiago in other countries, which opens up more development opportunities and offers more cities the chance to meet their own renewable energy goals. This post has been supported by EnelX.